Non-Members can register for AVALANCHE and MTR course credit. 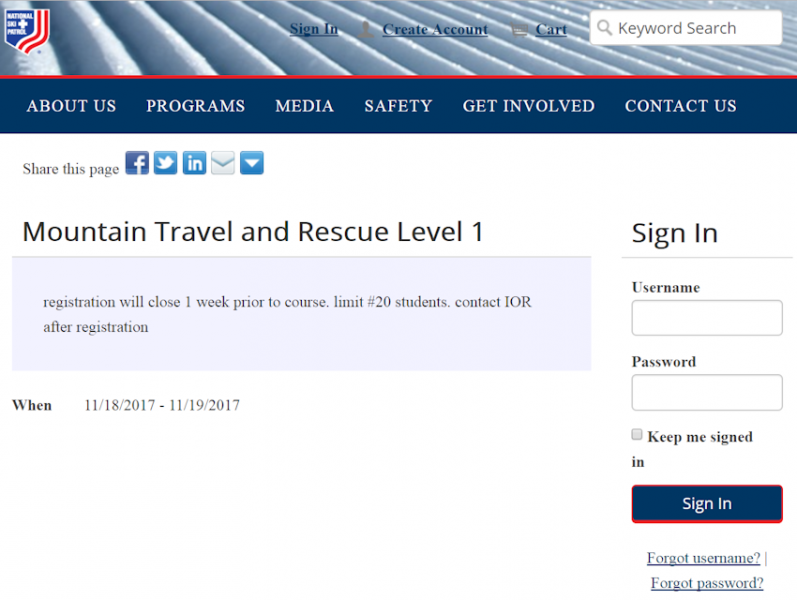 Patroller School requires that all non-members follow these steps, because receiving course credit may be required if you are a Search and Rescue volunteer or other organizations requiring proof of attended. However, the only way to receive NSP Course Credit is to create a “non-member account” on the NSP.ORG website. National Ski Patrol (NSP) is Eastern Division’s and Patroller School’s course credentialing body. If you are reading this “How To,” then you have most likely already found, registered and paid for a Patroller School educational event. Thank you for choosing to participate. The email confirmation receipt would have provided you with a link to the NSP.ORG’s course credit web page location, which looks like the picture on the right. Click the CREATE ACCOUNT link at the top. After your account is operational, you may need to return to the email confirmation receipt and click the Course Credit link again. NSP Course Credit Requests are like purchasing a product for FREE. Click the blue colored “REGISTER MYSELF” button to add the event to your purchase cart. Confirm that you want credit, and please ensure that you scroll to the bottom of the cart page and click the “SUBMIT” button. If you do not receive confirmation of the requested credit from NSP.ORG, then try again, the submission did not succeed. Help is available by contacting the Webmaster on the Contact Us page. Or phone the Instructor who sent you the original email course confirmation for more immediate help. <<< Back . . .